MOSCOW, November 29. /TASS/. 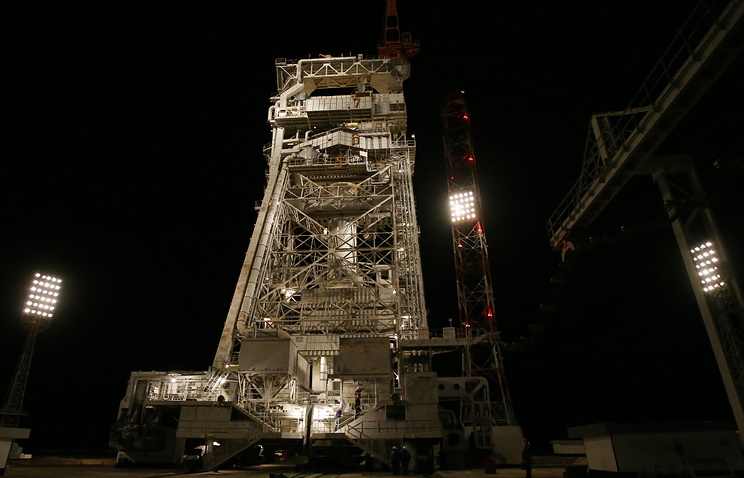 Russian Space Systems Company (part of the State Space Corporation Roscosmos) has modernized the system of liftoff measurements for the launch compound of the Proton-M heavy carrier rocket at the Baikonur Cosmodrome, the Company’s press office reported on Thursday. "The last stage of the trials has been concluded, the system has been put into operation and is ready for work during the 2019 launch campaign. The measurement system is designed to monitor the condition of all the assemblies and systems of the launch compound. It controls all the stages of the preparations for the launch of a carrier rocket: its placement on the launch pad, fueling and the pre-launch preparation and gathers information during the launch," the press office said in a statement. "We used the software in the new-generation system that allows performing all the operations for gathering, registering and processing information in an automated mode. The system can also carry out the pre-launch check of sensors and measuring equipment with an operator’s minimal participation. This increases the information content and raises the speed and the reliability of the system’s work," Deputy Head of the Department for the Support of Radio-Electronic Equipment Operation at Measuring Equipment Research and Production Association (part of Russian Space Systems) Igor Yudin was quoted by the press office as saying. The new system is based on the multi-functional digital transformation unit designed for receiving signals from sensors, transforming them into the digital code and processing, the press office of Russian Space Systems said. "The entire information that has been gathered is transmitted via the local computer network at a speed of up to 100 Mb/s. The multi-functional digital transformer comprises the power module and the modules of gathering information and transforming sensors’ signals. The transformer can be furnished with various transformation modules to increase the information level of pre-launch measurements," the statement says. Launch measurement systems developed and made at the Measuring Equipment Research and Production Association have been providing for the launches of Proton and Soyuz carrier rockets at the launch pads of the Baikonur Cosmodrome for over 50 years, as well as for the launches of Zenit carriers at the launch pad of the Sea Launch floating seaport. The systems are modernized every ten years.